There’s little renewal in post-war Japan seen through the lens of Akira Kurosawa. The citizens walk the streets with a semblance of normalcy, but grim reality lurks behind the scenes. Kurosawa’s first shot in Drunken Angel reveals the poisonous sludge of a sewage dump right next to people’s homes. He returns to this image repeatedly to nail home the idea of a world devastated by human cruelty. It’s not a stretch to connect this theme with destruction in Japan near the end of World War II. Tensions are high in a toxic environment where even the high-rolling yakuza bosses look miserable. Released in 1948, the dark crime drama builds a sour atmosphere where the threat of tuberculosis (and worse) hangs over everyone. Local doctor Sanada (Ikiru’s Takashi Shimura) works to stem the tide, but stubborn people rarely take his advice. His drunk tirades seem more like crazy rants than helpful tips, however. When your doctor is screaming and throwing things at you, he doesn’t seem reliable. 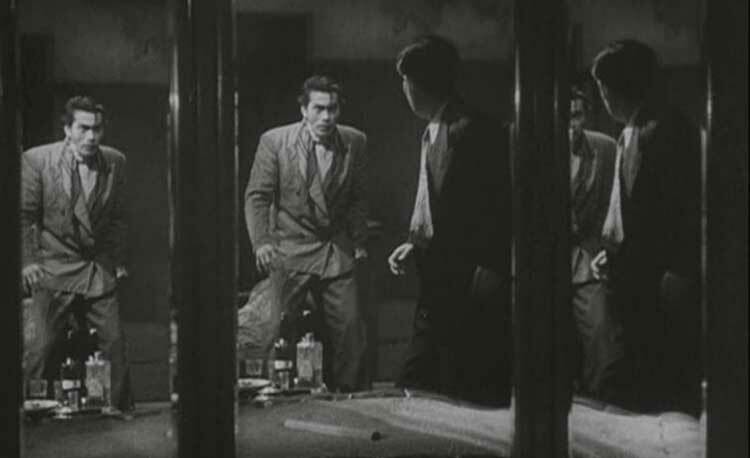 The local yakuza Matsunaga (a surprisingly young Toshirô Mifune) is seriously ill, but slowing down refutes his lifestyle. It’s hard to resist alcohol when temptation exists at every corner. There’s also the honor code and its false sense of pride in martyrdom. The “angel” in the title refers to Sanada’s drive to help patients, though he’s hardly pure. Alcohol is his daily vice. One clever shot brings his face parallel to the next cocktail. The obsessed look on Shimura’s face as he licks the top of the glass says it all. This unquenchable drive for alcohol makes Sanada the town fool despite his successes. He cures a teen girl and barely enjoys it. Failures like Matsunaga hang over him, at least for a time. Their relationship shifts between hatred and friendship at a moment’s notice. The repeated trend of their brutal squabbles nails home the point. They’re like ferocious animals but are kindred spirits through a mutual need for self-destruction. Guitar music from the unnamed player (Sachio Sakai) frequently playing in the background and sets the mood. He sits outside the bog and strums a mournful tune while the doctor tries his best inside the house. It’s a clever way for Kurosawa to set up the sense of place in various settings. There’s always a reminder of the polluted water and ugly structures right outside. It’s also an inventive method for Kurosawa to keep bringing us back to the destruction. When Matsunaga passes out at one point, the camera drifts along the water back to the guitar player. The journey through the muck is more important than the destination in that case. Another theme is debunking any honor code among the yakuza, a legendary group that resembles petty criminals backstabbing each other for power here. Matsunaga tries to match the tough yakuza reputation, but there’s still a little heart beneath his gruff exterior. The older bosses are much worse. Okada (Reizaburô Yamamoto) returns from jail and acts like he owns everything. He even grabs the guitar (which seems like a violation) and plays “The Killer’s Anthem” — his favorite song. Okada uses intimidation and the threat of retribution over actual violence. Women are his to do with as he pleases, and few dare cross him. There’s a strange familiarity with his approach and that of our recently elected president. He may be friendly on the surface, but that smiling face hides the monster underneath. Kurosawa’s messages are fairly obvious, but Drunken Angel still packs a visceral punch. The main reason is the remarkable work from the two lead actors. This was the first collaboration for Kurosawa with Mifune, who starred in some of the director’s top films like The Seven Samurai and Rashomon. Mifune gets the flashier role and makes the most of it. By the end of the story, Matsunaga looks more like a pale vampire than a human being. In one shot, there’s a surprisingly close resemblance between Mifune and Max Schreck as Nosferatu. Matsunaga is already half-dead before his bosses turn the screws on him. 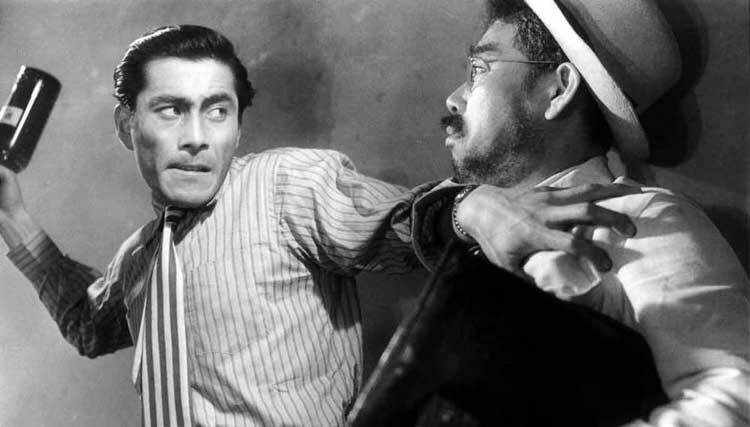 Mifune plays wide-eyed insanity so well, but there’s little glee this time. It’s a tragic look at a guy committed to a code that doesn’t exist. One standout sequence is a surprisingly lively dance number with jazz singer Shizuko Kasagi belting out an original tune called “Jungle Boogie”. There’s no connection to the Kool & the Gang version beyond the funkiness. This scene is energetic but also reveals the end of Matsunaga’s success. Okada is about to scoop up his girl Nanae (Michiyo Kogure) and steal his territory. Matsunaga also seems “like a punk” to the onlookers when compared to the veteran. He is all raw emotion, while the more sinister Okada stays grounded (at least for now). The scene ends with a jarring cut to Sanada smacking Matsunaga that drops us back in reality. What keeps this picture from becoming too nihilistic is the heart from Shimura in the title role. In one comic moment, he repeats the phrase “I absolutely refuse” when asked to help Matsunaga. A quick cut shows him doing exactly that in the next moment. These moments of levity from Sanada keep us connected to him right to the end. One subplot involves the hiding of Okada’s former girlfriend, who now lives with Sanada. Kurosawa sets this up as a key plot point, but it strangely disappears in the final act. Sanada’s defiant choices are another way to separate him from the immoral yakuza. He’s still a good guy trying to make a small difference. The final showdown between Matsunaga and Okada has no resemblance to grand showdowns between good and evil. It’s a vicious hand-to-hand fight that includes Matsunaga puking out blood and both guys sliding around in paint. Okada loses his aura of cool and reveals his true colors as a thug. This ugly look at violence makes a clear point about the lack of glory in battle. Sanada’s comment that “human sacrifice has gone out of style” also directly references the kamikaze fighters during World War II. Matsunaga’s efforts to die a good death look foolish and spring from a corrupted belief system in a post-war culture. There’s an interesting silver lining in the end of Drunken Angel that offers a glimmer of hope. When the cured teen arrives with her diploma, she’s a vision of a possible brighter future. Kurosawa ends the movie by pulling back the camera and revealing the crowd of citizens going about their lives. On one hand, no one cares about Matsunaga and his scattered ashes. It’s a callous society, yet it keeps moving forward. The swamp remains as a blight from the past, and even a rational guy must realize there’s still a long way to go before real progress. Drunken Angel is currently streaming on Filmstruck and available through Criterion. I didn't like it as much as you. I know it's considered Kurosawa's directorial breakthrough, and does start out promisingly and is well-acted. I get that it's a look at the aftermath of World War II, but to me it needed more actual story. While reading your review, I felt like you got a lot more out of the film than I did. I agree that the story is pretty thin, but the acting and mood still made it work for me. I wouldn't call Drunken Angel one of my favorite Kurosawa films, yet there was still enough for it to click for the most part. You nailed it on the head here. I found the film to be brave in its explicit condemnation of organized crime, and in its implicit anger towards Japan's past. The rejection of 'feudalistic' culture; dedication to codes that don't exist: all in all suggestive of a new mindset, trying to move forward by extricating oneself from the 'irrational' or backward tendencies of the past. To me, this is a solid piece of filmmaking, and for a lesser known Kurosawa film, is as good in quality as the average drama being made nowadays. A testament to how REMARKABLE a filmmaker he was. Thanks. I was surprised by how good Drunken Angel was given the lack of attention it generally receives in terms of Kurosawa's career. I shouldn't be shocked given his skills, but it still grabbed me a lot more than I expected.